At Classy, every product manager guides a team of web developers focused on a specific product or feature. Whether that nonprofit technology is part of the Fundraising Suite, the Classy for Salesforce Integration, or something entirely novel, each team aims to make the lives of nonprofit professionals a little easier, more productive, and even more rewarding. In this post, we’ll dive into what product managers are working on or have recently released, inspired by product team demos at the Collaborative. Classy has a team dedicated to its integration with Salesforce. The integration aims to make constituent relationship management seamless with an organization’s fundraising efforts on Classy. Since 2013, the integration has passed data from Classy to Salesforce, so organizations using the Salesforce CRM can better organize supporters, communicate with them, and tie donations to impact. In its largest update yet, the team is utilizing the new Classy API to give organizations a 360 degree view across all their efforts on both Classy and Salesforce. When Version 6 is released in early fall, users will be able to pass data both from Classy to Salesforce and vice versa. The new technology also facilitates more ways to backfill data, improve integration logging, and build custom add ons. Editor’s note and 2017 update: Version 6 was not released in early fall to incorporate more user feedback and may not include full bi-direction capability in its first iteration. Stay tuned for release in early 2017. To learn more about Version 6, check out our learning series. While you may consider Classy just a fundraising platform, it can be much more than that when integrated with other products or services you rely on. The Classy for Salesforce Integration is a great example: we know that having Classy data sync with Salesforce can be the key to an organization’s growth. 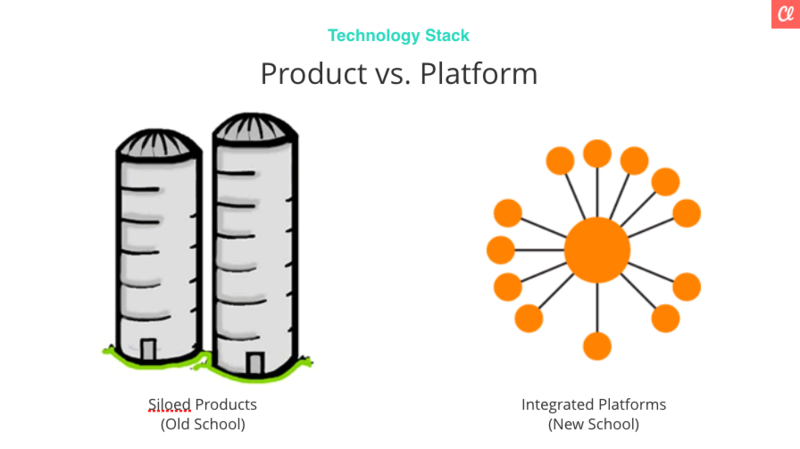 Together, this set of systems or platforms that speak to one another to power your business is called a technology stack. “Organizations need many different tools or softwares to manage their business. So, while Classy won’t be all those things, it can be at the center of an organization’s technology stack, communicating to other platforms so your data and day-to-day activities are seamless no matter what other platforms you use,” explains Classy API Product Manager William Harris. At Classy we use WordPress for our blog, HubSpot to send emails, Salesforce for customer relationship management, and RJMetrics to understand product metrics (among many other technologies). Together, these web applications help us speak the same language across the company. 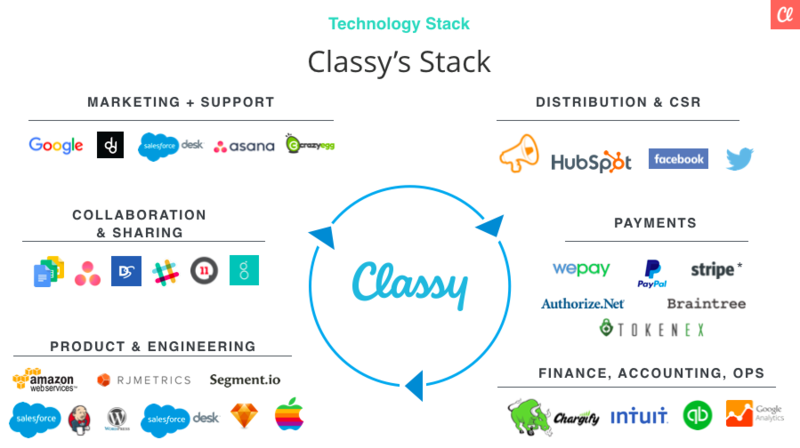 Classy’s technology stack in a slide from William Harris’ Collaborative presentation about the Classy API. The same can be said for one of our nonprofit partners. They might use Classy for fundraising, Salesforce for constituent relationship or donor relationship management, WePay for payments, Intuit for account, and much more. When information can more seamlessly pass through all the solutions your team uses, the potential of your organization to achieve whatever goal it dreams up becomes much, much easier and much less dependent on your size or resource capacity. As a robust platform, Classy could power a lot more than fundraising efforts. Our bread and butter—peer-to-peer fundraising—is getting a serious upgrade. At the Collaborative, Matt Lackey, the product manager leading the charge on the new Classy Fundraising Suite, discussed the research process and why we’ve redesigned the peer-to-peer campaign pages. “The pages we currently have on Classy work well, but they’re almost four years old. Since then, styles have changed and customers are increasingly creating custom pages with the Classy API,” he explained. To keep our modern pages modern and make custom pages accessible to more nonprofits, it was time to give peer-to-peer pages a facelift. Another upside? More features to support running successful peer-to-peer campaigns and coach individual fundraisers. The new Peer-to-Peer campaign page features more prominent images and two stylized call-to-action buttons. “The number one job of an organization running peer-to-peer campaigns is to support and communicate with those individuals who are fundraising on their behalf. That’s the statement from which an entirely new project around emailing and supporter engagement was born. Emailing is one of the most challenging, manual, and time-consuming activities for campaign managers (or, in many cases, a nonprofit professional who wears many different hats). Slide from Jennipher Wilson’s Collaborative presentation previewing Classy’s new emailing capabilities. 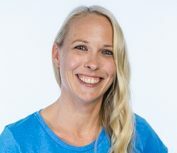 Jennipher Wilson and her team build tools that help organizations communicate with their donors and fundraisers during a fundraising campaign. With emailing on lock, nonprofits can run more successful, engaging campaigns. The first version will be available as part of Classy’s new, upcoming Peer-to-Peer campaign. In the example below, a nonprofit will be able to automatically send an encouraging message to an individual fundraiser who reaches a certain percentage of their fundraising goal. 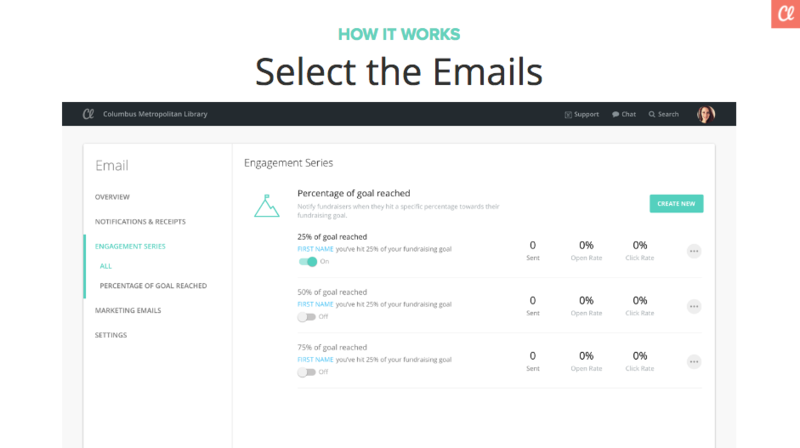 A mockup of the new percentage-of-goal email that will be included in Classy’s new Fundraising Suite. This peer-to-peer fundraising best practice gives individuals that extra push to continue their fundraising efforts. Soon, it will be automated and at your fingertips with Classy. From general donation campaigns to board fundraising to recurring giving campaigns, Classy Crowdfunding has proven its versatility. Organizations have turned to the new Crowdfunding campaign to build engaging, story-centric pages for their latest cause. Designed with best practices in mind, Crowdfunding has made building a beautiful and compelling campaign easier and faster. The John Wayne Cancer Foundation’s #ShowYourGrit campaign. Click to open. Meals on Wheels Central Texas’ Need for Steam capital campaign. Click to open. 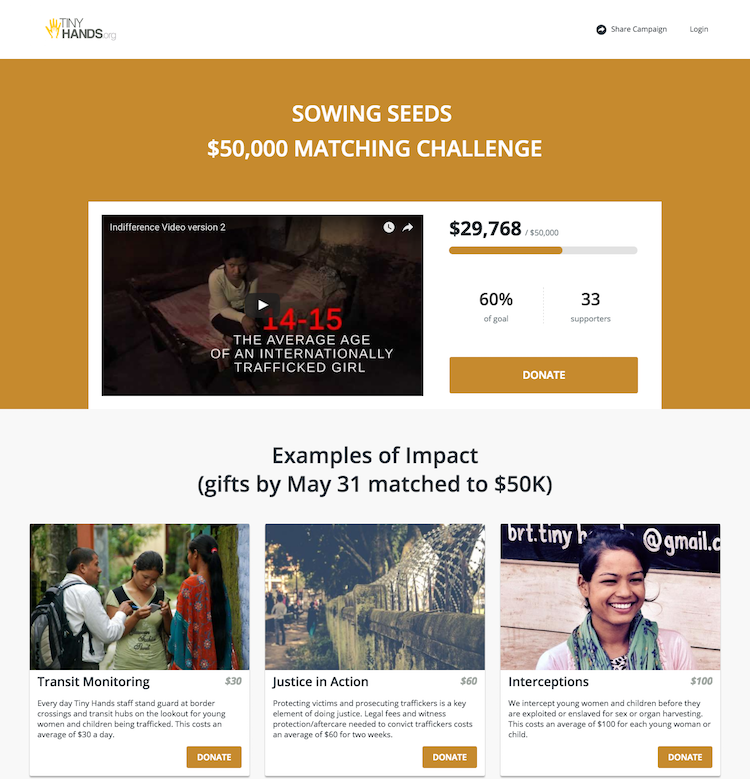 Tiny Hands’ Sowing Seeds match campaign. Click to open. 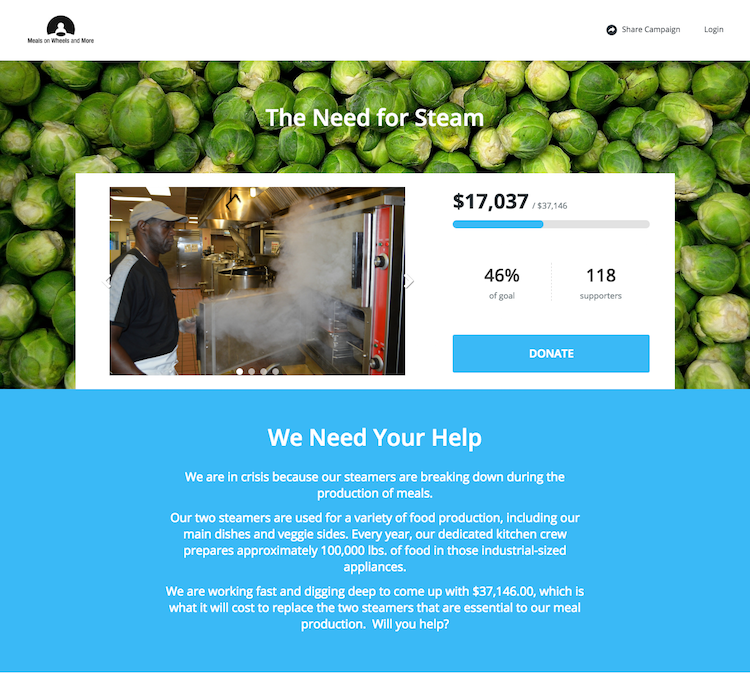 Senior Product Designer Terry Breschi designed the new Crowdfunding campaign layout and is currently working on Peer-to-Peer. 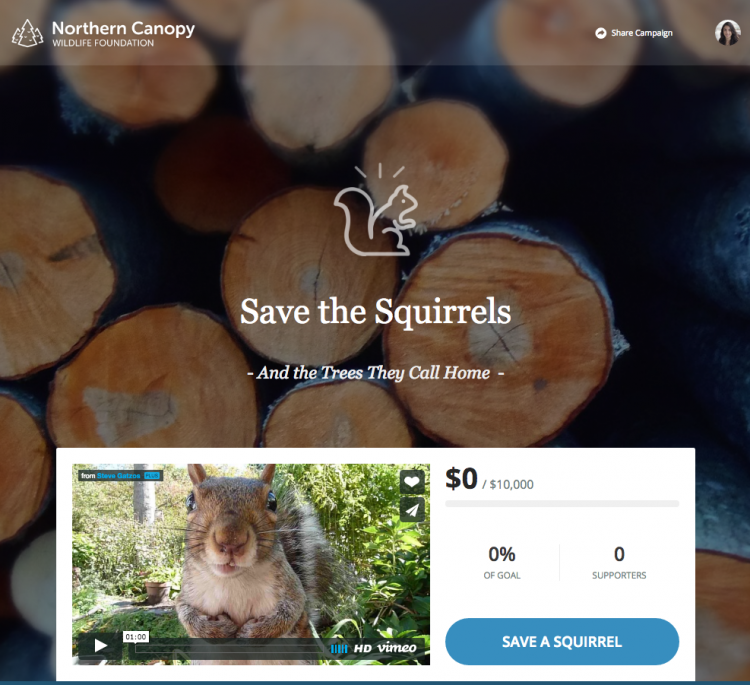 To demonstrate the full scope of Crowdfunding, Terry built a dynamic campaign page in less than 30 minutes using just Classy design tools. No endless hours in Photoshop were wasted in the making of this page. 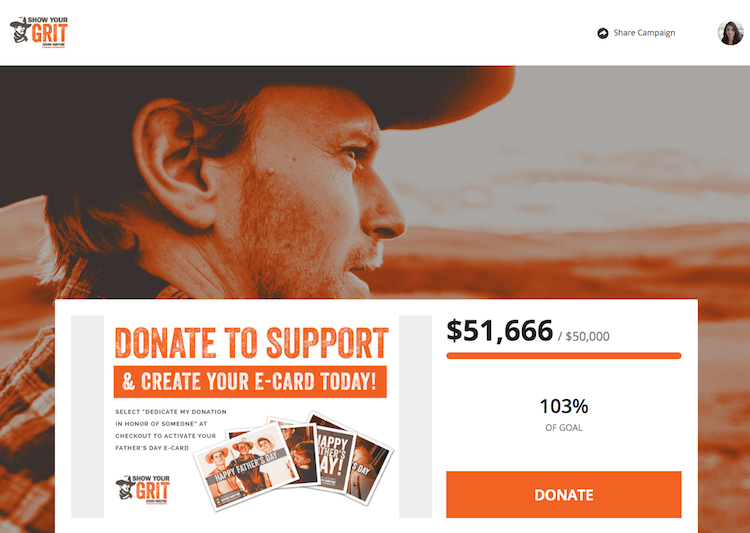 A screenshot of Terry’s example campaign. Click to open. Excited by the nonprofit technology you see? Sign up for the Classy Roundup at the bottom of this blog post to stay up-to-date on the latest from Classy.